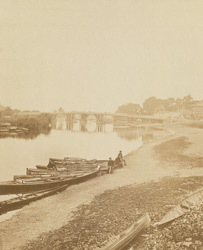 "The crazy, hog-backed, and inconvenient wooden bridge which formerly disfugured the Thames at Hampton Court, and obstructed its navigation, has within a year or two given place to a structure of iron, convenient for traffic and greatly improving the navigation. We wish we could say, in addition, that it imparted any new charm to the river; but alas! though it has not the ugliness of its predecessor, it can lay no special claim ot any beauty of its own. The design of its balustrade is said to be in unison with the Tudor portion of the Palace! It was opened for traffic in 1865."